Want to make a classic Thai curry without having to keep a watchful eye? Are you looking for a simple way to create restaurant favorites like Pad Thai in your own kitchen? 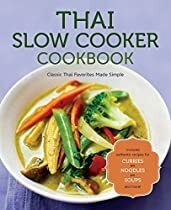 With the Thai Slow Cooker Cookbook, you can enjoy fresh and flavorful Thai dishes at home with the convenience of your slow cooker. Why slow cook? Slow cooking consolidates steps, takes out the guesswork and infuses dishes with flavor–no need to wait a day or two for the dish to rest. Got the goods? Stock your pantry the Thai way with a list of essential ingredients and shopping tips for hard-to-find ingredients. Short on time? All the slow cooker recipes in this book prep in 20 minutes or less. Craving Thai sides? Supplement your slow-cooked meals with recipes for classic Thai sides, like papaya salad, chicken satay, and curry puffs. Dietary restrictions? With a mix of dishes great for omnivores and vegetarians alike, labels also indicate if a recipe is soy-free and/or nut-free. Today’s busy world can make getting a healthy and satisfying meal on the table a challenge. Skip the wait for takeout and come home to wholesome Thai food, cooked by you, for you.